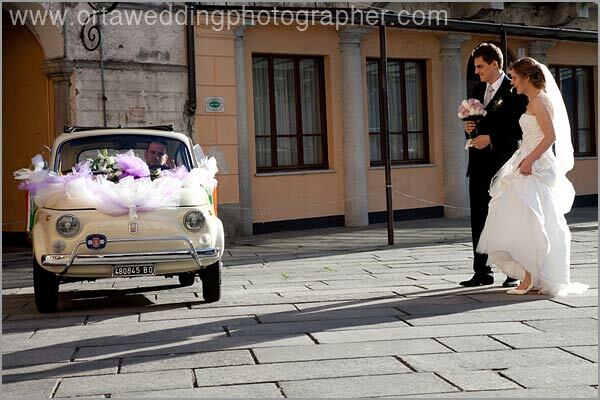 Last week Paola told you about wonderful wedding of Shauna and Marco on Lake Orta and their original choice to rent a vintage Fiat 500 for their movements during the wedding. 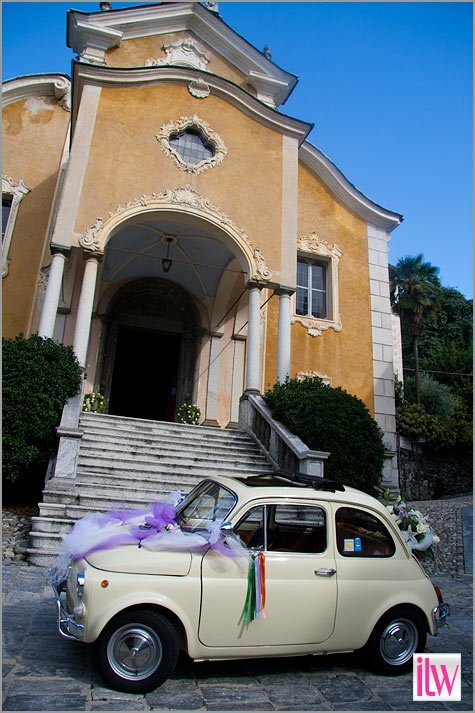 Shauna our Irish bride arrived up to the church of Assunta on this epic Italian car with funny green-white-orange and green-white-red ribbons on just to recall respectively Irish and Italian National flags. 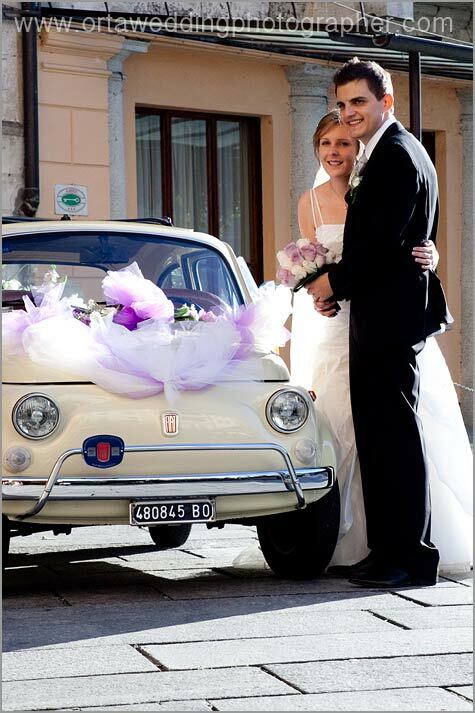 After the ceremony bride and groom got on vintage Fiat 500 to reach famous Orta main square where was a motorboat waiting for them to lead them to St. Julius Island for wonderful wedding pictures. 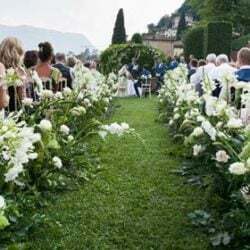 Back to Orta pier, Shauna and Marco got back on Vintage 500 to reach a lovely Castle above Orta where their families and guests were waiting for them. The choice to rent a vintage Fiat 500 was really nice and funny everybody loved that especially guests coming from Ireland. 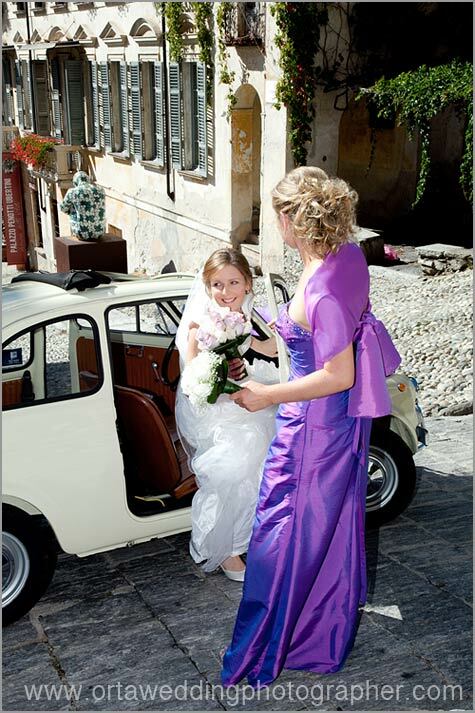 Fiat 500 is a real Italian style icon. 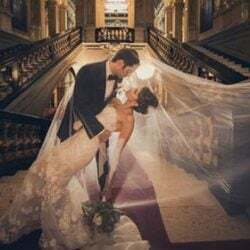 When you think about Italy many think about wonderful food, pasta, pizza, or music Pavarotti, movies, Fellini and motors Vespa, Ferrari and naturally Fiat 500! Not many know that city of Torino (Turin) is Piemonte main city which also was the first Italian capital back in 1861. 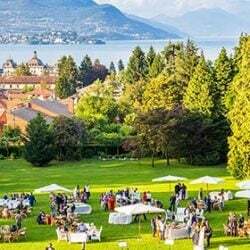 This year Italians celebrate the 150 anniversary of Italian Unity and celebrations will start just from Torino. Fiat 500 was produced in exactly in Torino. Fiat 500 history is quite strange. Benito Mussolini back in 30s called Senator Giovanni Agnelli – owner of Fiat – asking him to produce a cheap but nice car for all Italians. This should had the cost of no more than 5000 Liras. This was a great an progressive idea and Hitler decided to copy it asking to Ferdinand Porche to create a car for all Germans at the cost of about 1000 Marcs and this was the beginning of Beetle legend. 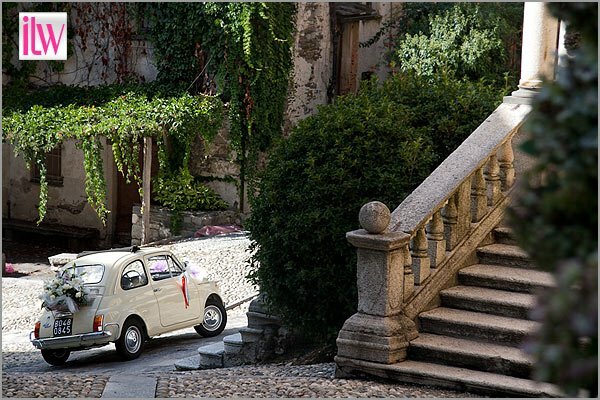 In 1936 the first Fiat 500 was born. It was also known as Topolino (Mickey Mouse in Italian) becoming the smallest car in the world that was mass produced. Its round shapes broke the tradition of classical squared ones. It was comfortable and nice and everybody could drive that. 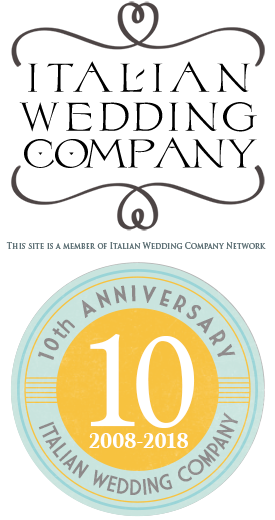 For this reason it had a great success making it an Italian icon all over the world. Top Gear magazine defined that The sexiest car in the world. 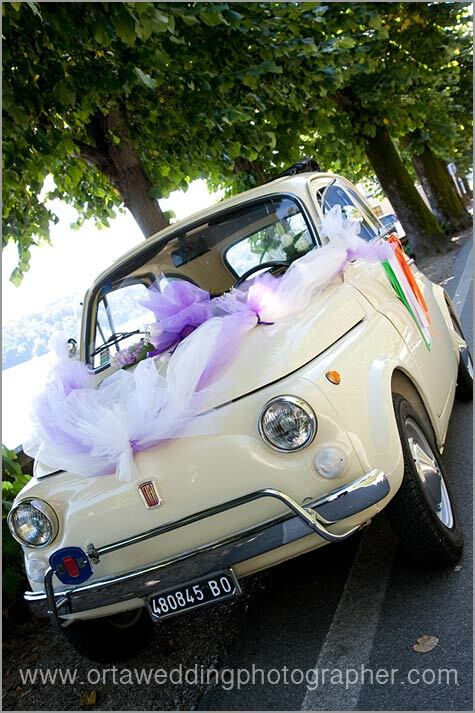 Why don’t consider to rent the Sexiest Car in the World for your wedding on Lake Maggiore and Lake Orta? 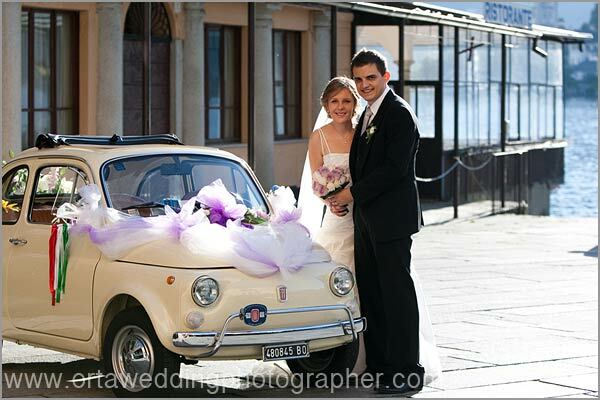 Italian Lakes Wedding put on your disposal the fantastic Fiat 500 that Shauna and Marco used for their wedding and that you can see here in this post! 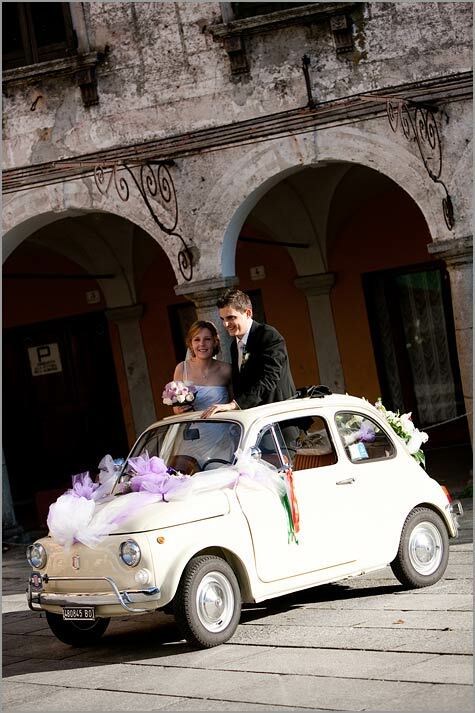 It is a cream Fiat 500 of 1972 perfectly maintained in its original version with sunroof and driver.